From graphics of the bathtub and wine glasses to speculation about botox and keto diets, TV channels covered it all. If Indian news channels cannot take you into the bathroom, they will bring the bathroom to you. The death of actor Sridevi on Saturday was destined to be big news, thanks to her pan-Indian popularity. That she died suddenly at the age of 54 added to the tragedy, leading to tributes from across India – and far beyond. But as further details emerged about how she died, India’s TV channels spotted an opportunity to flex their detective muscles and show off their computer-generated graphics skills. 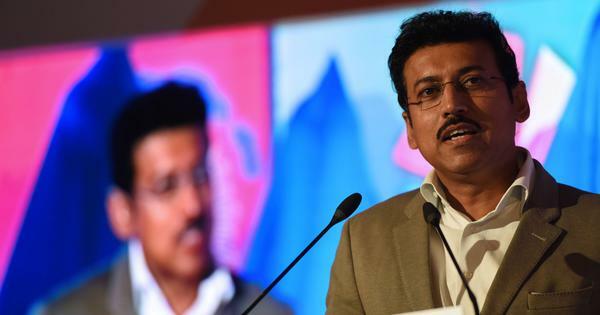 If you turned on just about any Indian news channel on the evening of February 26, you would have been confronted with the view of a pretend bathroom, with the pretence that the person on screen was commiting an act of journalism. It is true that there is more to Sridevi’s death than was originally reported. At first, the media said that she had died of a cardiac arrest in a hotel room in Dubai. Local police have since said that she died “after accidentally drowning in the bathtub of her hotel room following a loss of consciousness”. But the police have also ruled out any criminal motive, and her body is expected to be sent to India as soon as the formalities are complete. But that information, plus a reference in the forensic report indicating that “traces of alcohol were found in her blood”, was enough for news channels to decide on their story for the evening – even though elections were taking place in two Indian states the following day, tensions on the Line of Control remained high and the Punjab National Bank scam continued to develop. The combination of ingredients – a movie star, an unexpected death, a bathtub and the suggestion of some alcohol involved – was enough for news channels to forget that they were talking about the actual death of a human being with a family. AajTak for, example, ran a headline declaring “Maut ka Bathtub” (Bathtub of death), with a graphic of said bathtub. Another channel went a step further and included a wine glass in the bathroom, as if to underscore the point. Telugu channel Mahaa News put a crime reporter into a bathtub as it broadcast his speculation about whether it was possible for an adult to drown in a container of that height. Meanwhile, the gossip around Sridevi’s death has not just been limited to asking questions about those alcohol traces. Panelists on these shows trained their focus on Sridevi’s body, asking whether everything from the keto diet to botox might have been responsible for her drowning in a bathtub. The subject was not contained to just English and Hindi channels. Sridevi was a pan-India star, and so the tasteless TV graphics are pan-Indian too. After the Dubai Police recorded the statement of her husband Boney Kapoor, news channels turned it into “exclsuive news” about Kapoor being grilled, with contradictory information about what that might mean. 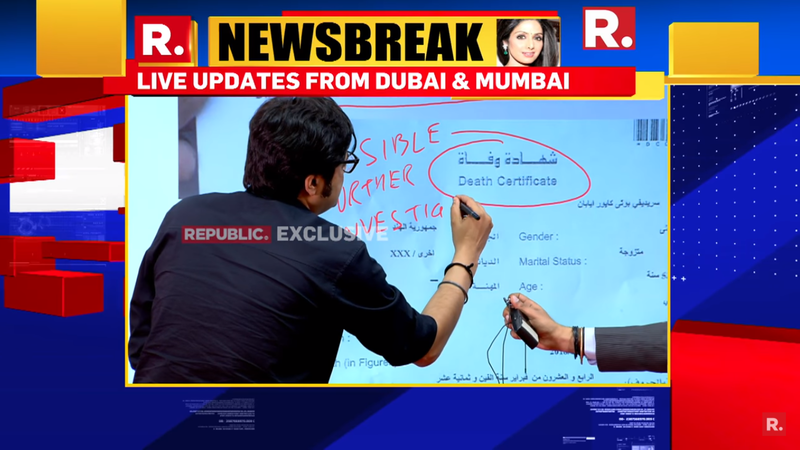 Arnab Goswami of Republic was naturally in on the game too, and for some reason decided to write “possible further investigation’’ on a screen showing a blown-up version of the death certificate as a fellow anchor awkwardly held out a mic. His old employer, TimesNow, meanwhile had a video listicle of three Sridevi death theories, including “consumed alcohol, was unable to maintain balance, fell & drowned”. Accross the channels, all sorts of people with varying degrees of connection to Sridevi’s death were asked to offer their opinion, including Amar Singh and Subramanian Swamy. A few, like Mirror Now and NDTV India, however, decided explicitly not to cover the death. But for the most part, primetime news was dedicated to discussing the details of Sridevi’s last moments. The response on Twitter seemed to have one common refrain: That the real death to mourn at the moment was that of the Indian news media. 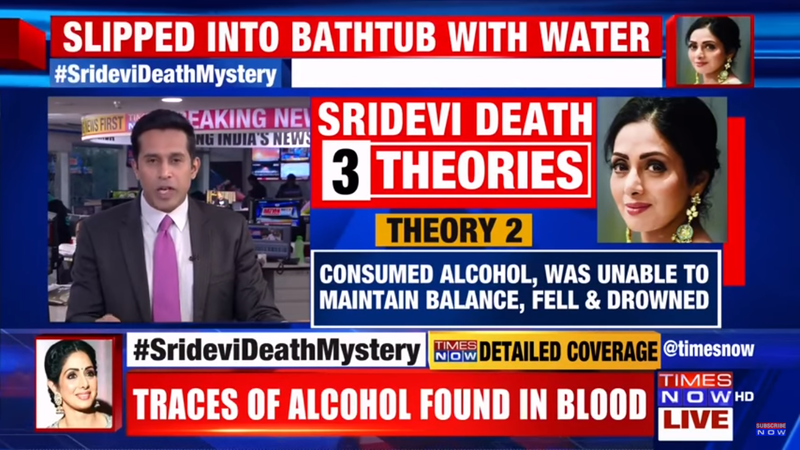 While other channels were mindlessly speculating over #SrideviDeathMystery & standing in grotesque bathroom chroma sets #WhySoSerious decided to upstage them all and get you a live report on #Sridevi (and the state of Indian media) from the bathtub itself. You ignore 254 movies in 5 languages over 45 years. You presume, conjecture, mock a death clutching a sketchy preliminary report. Both the #Dubai police and two channels in India have started investigation into #SrideviDeathMystery. One anchor points to spelling mistake in DRAWNING and one guest has already mentioned Sunanda pushkar.